Expert sources state that the excess costs of a smoker to the employer is about $6,000 per year: $2,600 in lost productivity and $3,400 in excess health care costs. Our Mission is to help clients’ team members and dependents create a healthier lifestyle, prevent dangerous, lifelong health issues, and reduce costs and lifestyle restrictions caused by tobacco use and addiction. Tobacco addiction is classified as a chronic relapsing addictive disorder. That’s why sustainable, positive outcomes can only be achieved when support is available as needed over time. Across America, companies are offering various forms of tobacco cessation programs; by choosing the Quit With Nancy™ Tobacco Cessation Program©, you’ve demonstrated an understanding of the significant health costs associated with tobacco use and the desire to address this chronic problem. 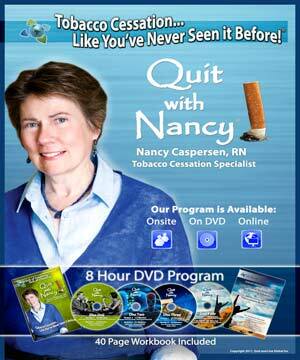 Quit With Nancy™ has continuously achieved some of the highest quit and reduction rates in the country. Our corporate quit rates average 65% at the 12-month follow-up, with an additional 20% have reduced their tobacco use. This quit and reduction rate of over 85% is a predictor of the long-term commitment and success of each of these ex-tobacco users. High level, in-depth content teaches tobacco addiction and treatment in an engaging, user-friendly format. Home-based education allows for course completion at an individual’s own pace. Greater use of appropriate tobacco cessation medications/tools and increase the likelihood to seek medical provider input. Physical DVD delivers pass-along and review value for participants. The online program offers easy access from any device: phone, tablet, laptop, etc. This new interactive online option will make the same content more versatile depending on the employee’s viewing and scheduling needs. The online version will have additional learning aids such as graphic flashcards and chapter questions to boost material absorption as the participant views each module. The process approach to tobacco cessation means less pressure and greater success rates. Proprietary motivational teaching style has proven to increase the desire to quit. 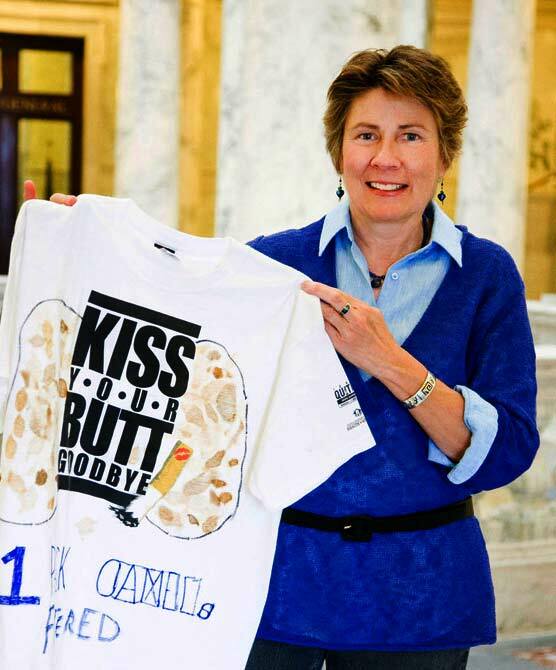 It is with pleasure that I write to recommend Nancy Caspersen and her product Quit with Nancy Tobacco Cessation Program. Prior to my retirement, I served as the Benefits Director for a large organization that utilized Nancy’s services for a number of years. I found it most delightful to work with her and found her very innovative in her approach to tobacco cessation. Her concern in working with individuals who wanted to stop using tobacco or e-cigarettes helped them find the belief in themselves that when coupled with her program and tools resulted in helping them reach their objectives. I can confirm that I found the successful quit rates that Nancy shares to be conservative in my experience. Her program helped many individuals that I am aware of quit using tobacco products for good. This resulted in positive life changes for these individuals as well as reducing expense to the Company benefit program. I watched the entire DVD with my son and Mom last weekend. We were all SO IMPRESSED! We kept saying…we’ll just watch one more section and then quit for the evening…but we were hooked! My goodness, the DVD turned out so nice!!! Many employees have been successful in making the changes to eliminate tobacco use and qualify for the health plan contribution discount.